MEMPHIS, Tenn. (AP) The Los Angeles Lakers had won four straight games behind a stalwart defense. It didn’t come with them to Memphis. The Lakers were without Lonzo Ball, who injured his left knee in Saturday’s overtime win at Dallas, and Brandon Ingram also didn’t play because of a left ankle sprain. Lakers: Los Angeles signed G Gary Payton II to a two-way contract. He appeared in 12 games for the Milwaukee Bucks, six of them starts, averaging 2.5 points and 1.4 rebounds. He scored four points in 12 minutes against Memphis. 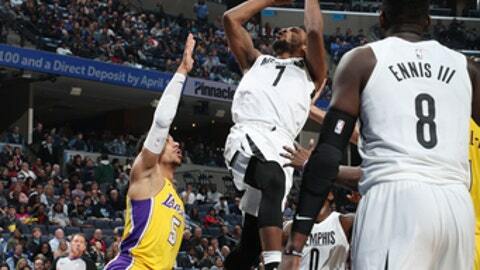 … The Lakers have lost seven straight road games in the series, and their last win in Memphis was in December 2013. Grizzlies: This was the 16th annual game for the Grizzlies on Martin Luther King Day. King was killed on April 4, 1968 at the Lorraine Motel a short distance from FedExForum. … The Grizzlies are now 7-9 on games surrounding MLK festivities. … The Grizzlies honored former NBA players Sam Perkins, James Worthy and Anfernee `Penny’ Hardaway, along with WNBA player Swin Cash with the 13th Annual National Civil Rights Museum Sports Legacy Awards. … F Deyonta David recorded his third block – a career-best – in the second quarter. He ended the night with five. Bickerstaff, Memphis’ interim coach, said it is a matter of recognizing the price paid by others in the fight to reach where players are today. ”When you have this opportunity to pay that respect, you do this job with the best of your ability and you give everything you’ve got in honor of those who had to fight those fights for you,” Bickerstaff said.